BackgroundGeneral practitioners (GPs) often decide to refer patients for medical imaging with ionizing radiation and are therefore responsible for assessing the benefits of the procedure against the possible risks. ObjectiveTo assess the level of general practitioners’ knowledge concerning radiation doses for patients undergoing common radiological investigations and the associated risks of these radiation doses. MethodI used a self-administered postal questionnaire survey sent to all 200 GPs working in municipal general practices in Bergen to investigate their knowledge about radiation doses and the risks associated with ionizing radiation. ResultsThe response rate was 47%. Most GPs showed poor knowledge of radiation doses and associated risks. Male GPs had greater knowledge compared with female GPs (P=0.049). GPs with training in radiation safety had significantly greater knowledge compared with those with no radiation safety training (P=0.005). ConclusionOverall, GPs’ knowledge of radiation doses and the risks associated with ionizing radiation was reported to be poor. The number of medical imaging examinations involving ionizing radiation is increasing in Norway. For example, a total of 4.14 million medical imaging examinations were performed in the year 2002, of which examinations with ionizing radiation (X-ray and computed tomography (CT)) constituted 3.38 million (742 examinations per 1000 inhabitants), an increase of 15% per 1000 inhabitants since 1993. The average radiation dose due to medical exposure in Norway per inhabitant per year is 1.1 milliSivert (mSv). This is higher than the dose recommended by the International Commission on Radiological Protection (ICRP) of 1 mSv, and it is higher than the average dose in other European countries. For example, while diagnostic X-ray use in Norway causes 1.2% of the cumulative risk of cancer to age 75 years in both men and women, equivalent to 77 cases per year, the cumulative risk of cancer numbers in Sweden, Finland and the UK are 0.9%, 0.7% and 0.6%, respectively. The decision to refer a patient for medical imaging with ionizing radiation is the responsibility of the physician, who compares the benefit of the procedure with the expected risks involved. The indications for use of ionizing radiation always need to be weighed against the potential risks of exposure. It has been reported that 70% of physicians almost always refer their patients for an X-ray examination to complete the medical diagnosis.5 However, 20% of referrals were reported to be clinically unhelpful [6,7] and many physicians recommend such examinations with no knowledge of the risk–benefit ratio to the patient. Physicians need to have a clear understanding of the radiation risks associated with specific imaging examinations. InNorway, patients are registered with a GP, who is responsible for coordinating health services for his/her patients. GPs act as gatekeepers, referring their patients for imaging procedures and having open access to all imaging examinations including CT, magnetic resonance imaging (MRI) and ultrasound. The GP is therefore supposed to possess distinctive knowledge in order to keep radiation exposure as low as possible and to justify any procedures undertaken. If the referrer has inadequate knowledge of radiation exposure and the consequent risks, patients may be investigated using high-dose examinations. Instructing patients about radiation and its effects should be an integral part of physicians’ responsibility, because patients need to make decisions about alternative methods of investigation based on their knowledge of the advantages and disadvantages of the particular procedure. However, many patients are not guided or instructed regarding the hazards of radiation and the long-term potential damage. [9,10] Despite the fact that the average radiation dose due to medical exposure per inhabitant is higher than the recommended dose from the ICRP and that in other European countries, no studies have been carried out in Norway to assess the awareness of hazards associated with ionizing radiation in diagnostic imaging examinations among referring physicians. The present study assessed the GPs’ knowledge concerning radiation doses and the risks to patients when they undergo commonly requested radiological investigations. It is hypothesised that GPs may not be aware of radiation hazards associated with the imaging procedures they commonly use in their practice. This was a descriptive study using a one-time survey. The study was carried out in the city of Bergen, Norway, with a population of approximately 300 000 people. GPs from all the municipal general practice centres in Bergen city were contacted and asked to participate in the study. An enquiry was made to the Director of Health Care Services, Bergen for consent regarding participation of GPs in the study. After approval, questionnaires with an accompanying letter were sent to all GPs in the city of Bergen. The letter outlined the aim of the project, provided assurance as to the confidential treatment of information gathered from the questionnaire, stressed the voluntary nature of participation and, finally, informed participants that they could access the results of the survey by contacting the author. The questionnaires were collected after two weeks. The study population consisted of all GPs (n=200) practicing in the city of Bergen. A total of 200 questionnaires were distributed. After the reminder letter 93 GPs (47%) responded. Fifty-four respondents were male and 39 female. The majority of the respondents (n=84) had had no training in radiation safety. 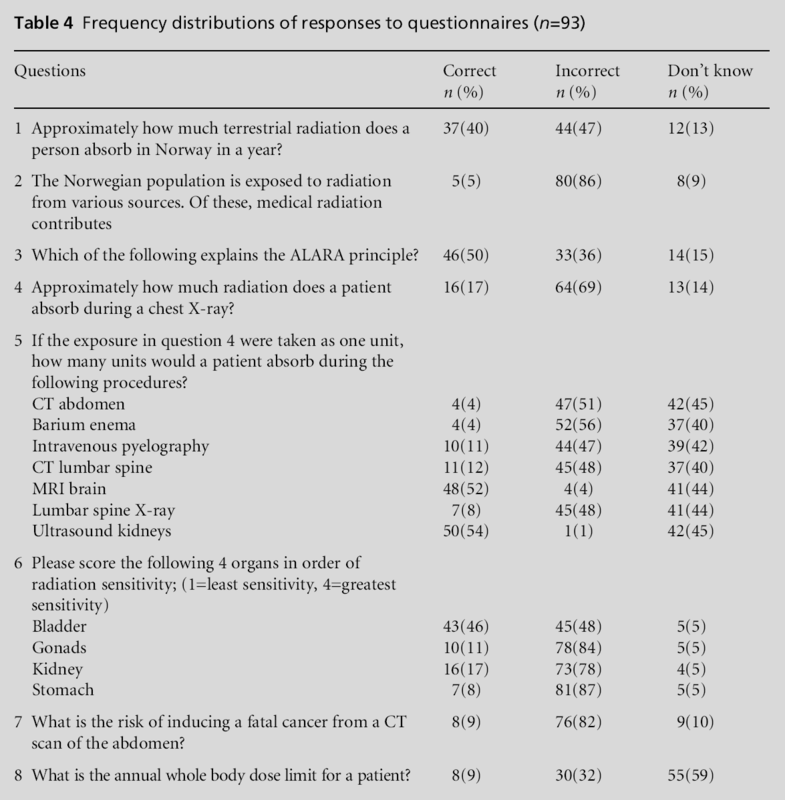 GPs’ knowledge about radiation and associated risks was assessed using the modified Norwegian version of the English questionnaires that were utilised in earlier studies. [11–13] The modified Norwegian version of the questionnaire consisted of radiation-related issues and covered demographic information including gender and whether GPs had undergone training in radiation safety after graduation. To capture information on whether GPs knew that magnetic resonance imaging (MRI) and ultrasound were non-ionizing procedures, questions on these techniques were included in relation to specific organs. The answers were measured using a three-point scale – correct, incorrect and don’t know. The ‘correct’ answer was given one mark and no mark was given for ‘incorrect/don’t know’. The total score ranged from 0–17, with higher scores signifying greater knowledge about radiation doses and risks associated with medical radiation procedures. The answers to the questions are presented in this section. The approximate average annual terrestrial radiation dose per inhabitant in Norway is between 1 and 5 mSv.2 Medical radiation contributes between 20 and 29% of total radiation sources. 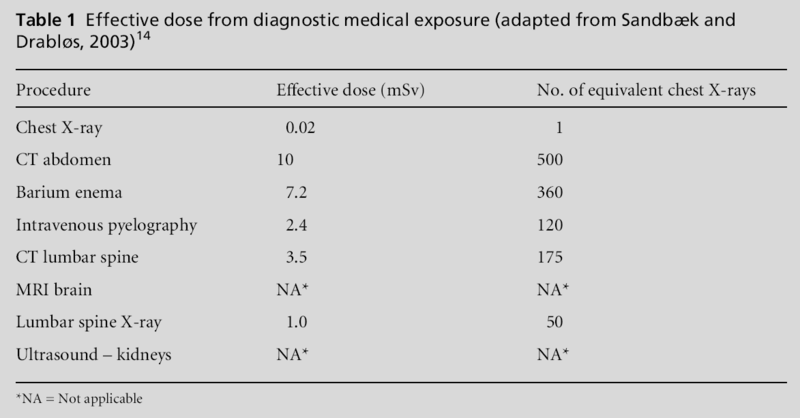 Approximate radiation dose during a chest X-ray is 0.02mSv. The risk for developing fatal cancer from a CT abdomen is 1 in 200015 and there is ‘no limit’ for annual body dose for a patient. According to ICRP publication 103 (2007) the stomach is the most radiation sensitive organ followed by the gonads, bladder and finally the kidney. The effective dose and number of chest X-ray equivalents for the different procedures14 are presented in Table 1. The director of Health Care Services in Bergen gave permission for the implementation of the study. All participants were informed that participation was voluntary and they were guaranteed anonymity and confidentiality. Descriptive statistics (frequencies, percentages, means, and standard deviations (SD)) are presented for the summary score and for the demographic characteristics. Independent t-tests were carried out between genders (male versus female), and between categories of staff training (GPs with radiation safety training versus GPs without radiation safety training). A Pvalue of 0.05 or less is considered to be statistically significant. 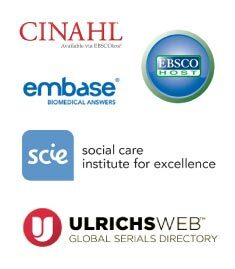 All statistical analyses were carried out in the Statistical Package for Social Sciences (SPSS) for Windows (version 17.0) (SPSS Inc., Chicago, IL, USA). A total of 93 questionnaires were analysed. The mean summary score was 3.58 (SD 2.3; range 0–12). Of a possible 17 points, eight GPs scored zero and only one GP scored more than nine points (50%). The distribution of marks is shown in Figure 1. Most physicians were unaware of the approximate average size of terrestrial radiation dose per Norwegian inhabitant per year, the approximate amount that medical ionizing radiation contributed to the total radiation, the As Low As Reasonably Achievable (ALARA) principle, the approximate dose for a chest X-ray, the different levels of radiation from a particular examination, the risk of developing fatal cancer from a computerised tomogram of the abdomen, and the annual whole body dose limit for patients. 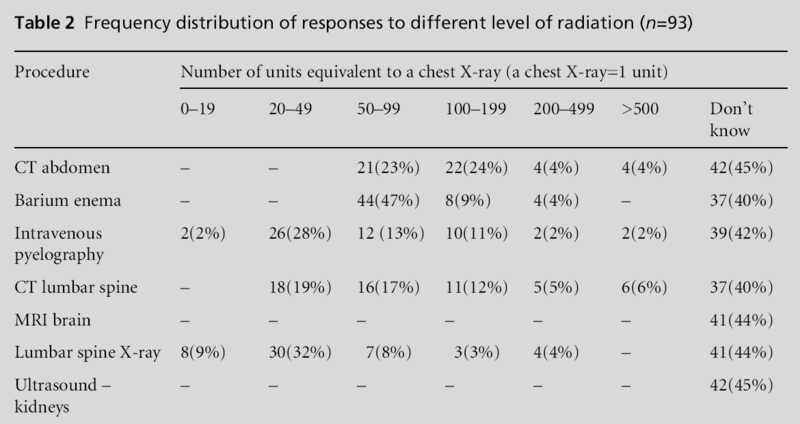 The GPs’ responses to the different level of radiation from a particular examination and the order of radiation sensitivity of organs are presented in Tables 2 and 3. The number of GPs who gave the correct answer to each of the questions is presented in Table 4. Independent t-tests identified significant differences between male (mean score 3.96, SD 2.4) and female GPs (mean score 3.05, SD 2.1, P=0.049), and between GPs with training (mean score 6.17, SD 2.1) and without training (mean score 3.44, SD 2.3, P=0.005) in radiation safety. Poor knowledge and underestimation of the actual dose may lead to imaging examinations with ionizing radiation being prescribed more often, resulting in an increased risk for patients. GPs therefore need to consider the necessity of imaging examinations, to be aware that MRI and ultrasound are nonionizing radiation procedures, and to consider whether the diagnostic information could be obtained from non-ionizing imaging examinations such as MRI and ultrasound. A possible explanation for the findings could be that attendance on radiology courses during undergraduate medical training is not compulsory, and that radiology examination focuses mainly on image interpretation and diagnosis. Proposing that the questions asked of GPs were difficult, resulting in the low scores, is not realistic. In relation to radiation sensitivity, only seven GPs reported that the stomach was the organ most sensitive to radiation. The majority of GPs (n=65) reported that the gonads were the organs most sensitive to radiation, indicating that GPs are not aware of the ICRP publication 103 which revised the tissue weighing factors and did not place gonads as the most sensitive organ. New guidelines should therefore be distributed to all referring physicians. With regard to training in radiation safety, the present study identified that GPs who underwent training in radiation safety reported a significantly higher level of knowledge than GPs without such training. This finding supports an earlier study which identified that training led to greater knowledge. It is therefore suggested that radiation safety courses should be made compulsory in medical programmes and that postgraduate courses should be offered to all GPs. Furthermore, guidelines must be developed so that GPs are more aware of radiation doses and associated risks, so that they refer patients to ionizing medical radiation procedures only when the benefits outweigh the risks associated with ionizing radiation exposure. Clinical guidelines result in a reduced number of Xray examinations. Male GPs reported a significantly higher level of knowledge than female GPs. This finding is interesting as well as surprising. However, there is no theoretical background to support this result. As a professional healthcare provider, one would expect a good level of knowledge among GPs regardless of gender. As with any study of this nature, this study was also constrained by certain limitations. The response rate was 47%. Neither the English nor the modified Norwegian version of questionnaires was validated. It is notable that 53% of respondents did not return the questionnaire. There is no explanation for this poor response, though participation was voluntary. Furthermore, there is no confirmation as to whether the GPs were present during the period of distribution or how well the questionnaires were understood. Therefore the study findings have to be interpreted with caution. The current study identified poor knowledge overall among GPs about radiation and risks associated with medical ionizing radiation. Male GPs and those with training in radiation safety reported significantly greater knowledge. It is essential that general practitioners are educated in the development of their skills and knowledge in this area because of the increasing number of medical imaging examinations with ionizing radiation. I thank Sandra Olin Molnes, Gry Aslaug Lønøy and all participants in this survey for sharing their time and experience. Ethical approval was not required for this improvement project. Smith H (ed). ICRP Pub. 60. 1990 Recommendation of the International Commission on Radiological Protection. Annals of the ICRP 1991;21:133. Gonzalez de AB and Darby S. Risks of cancer from diagnostic X-rays: estimates for the UK and 14 other countries. The Lancet 2004;363:345–51. Rassin M, Granat P, BergerMandSilner D. Attitude and knowledge of physicians and nurses about ionizing radiation. Journal of Radiology Nursing 2005;24:26–30. Royal College of Radiologists Working Party. A multicentre audit of hospital referral for radiological investigation in England and Wales. BMJ 1991;303:809–12. Royal College of Radiologists Working Party. A multicentre audit of hospital referral for radiological investigation in England and Wales. BMJ 1992;28:7–13. Gower-Thomas K, Lewis MH, Shiralkar S, Snow M, GallandRBandRennie A. Doctors’ knowledge of radiation exposures is deficient. BMJ 2002;324:919. Ludwing R and Turner LW. Effective patient education in medical imaging: public perceptions of radiation exposure risk. Journal of Allied Health 2002;31:159–64. Valentin J. Avoidance of radiation injuries from medical interventional procedures. Annals of the ICRP 2000;30:7. Jacob K, Vivian G and Steel JR. X-ray dose training: are we exposed to enough? Clinical Radiology 2004;59:928– 34. Soye JA and Paterson A. A survey of awareness of radiation dose among health professionals in Northern Ireland. British Journal of Radiology 2008;81:725–9. Quinn AD, Taylor CG, Sahharwal T and Sikdar T. Radiation protection awareness in non-radiologists. British Journal of Radiology 1997;70:102–6. Radiation exposure of the UK population from medical and dental X-ray examinations. NRPB-W-4. Didcot, UK: National Radiological Protection Board, 2001. Valentin J (ed). Annals of ICRP, Publication 103. The 2007 Recommendations of the International Commission on Radiological Protection. Oxford: Elsevier, 2008, p. 261, Table B2. Shiralkar S, Rennie A, Snow M, Galland RB, Lewis MH and Gower-Thomas K. Doctors’ knowledge of radiation exposure: questionnaire study. BMJ 2003;327:371–2. Arslanoglu A, Bilgin S, Kubali Z, Ceyhan MN, IlhanMN and Maral I. Doctors’ and intern doctors’ knowledge about patients’ ionizing radiation exposure doses during common radiological examinations. Diagnostic and Interventional Radiology 2007;13:53–5. Finestone A, Amir A, Richter E and Milgrom C. Do physicians correctly estimate radiation risks from medical imaging? Archives of Environmental Health 2003; 58:59–61. Lee CI, Haims AH, Monico EP, Brink JA and Forman HP. Diagnostic CT scans; assessment of patient, physician, and radiologist awareness of radiation dose and possible risks. Radiology 2004;231:393–8. Study Plan for Medical Students (Radiology), University of Bergen. 2009. www.uib.no/emne/MEDRAD (accessed March 2010). Royal College of Radiologists Working Party. Influence of Royal College of Radiologists’ guidelines on referral from general practice. BMJ 1993;306:110–11.